The embedded video below starts where the sculpin fishing starts. When I first saw the video, I thought the sculpin fishing part was a little unusual and then quickly forgot it when the tanago fishing section began right afterwards. It wasn't until a customer sent me an email asking about a kajika rod that I went back to watch the video again with specific interest in the sculpin fishing. My customer had asked about using a broken rod segment. Thinking about how fragile (and expensive) the tip is on any tenkara or keiryu rod, I immediately thought that a solid glass ice fishing rod blank might be a better choice. I had been wondering for some time whether an ice fishing blank would make a good micro fishing rod. I had never built a rod, always thinking that the jig and motor and all the other stuff you need to build rods could never be justified if you only built one or two rods. When I became interested in tenkara, all that was forgotten because back then there was no source for tenkara rod blanks anyway. 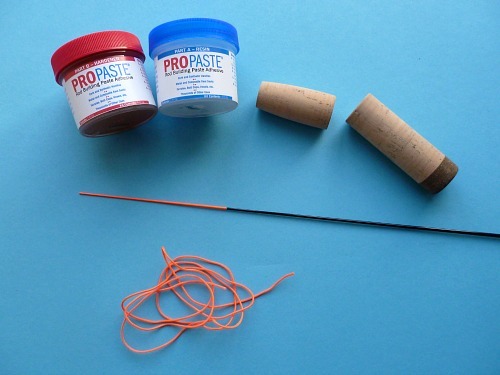 A sculpin fishing rod, though, is an insanely easy build. There are no guides to wrap and no reel seat to install. Seriously, the only thing it involves is gluing on a grip and a lillian. For a rod build, it doesn't get easier. All the components for a sculpin rod. It turns out that Mudhole has about anything you could want for rod building (except the lillian). I ordered a few ice fishing blanks, some grip sections and some epoxy. The blank I thought would work the best is solid glass with a bright orange tip, which is almost the exact same color as some bright orange lillian I had. (If you do this and need a couple inches of orange lillian, let me know). Orange lillian glued onto orange rod tip. Gluing the lillian onto the rod tip was very simple. A little epoxy on the rod tip and then slide the lillian on. With a one-piece rod, there is no reason not to have a knot in the lillian. The grip was a little trickier. Companies that specialize in rod building supplies do not have sculpin-rod grips. A tapered cork foregrip and a separate ice rod rear grip glued on and glued together and then sanded to the point where the junction isn't obvious completed the rod. 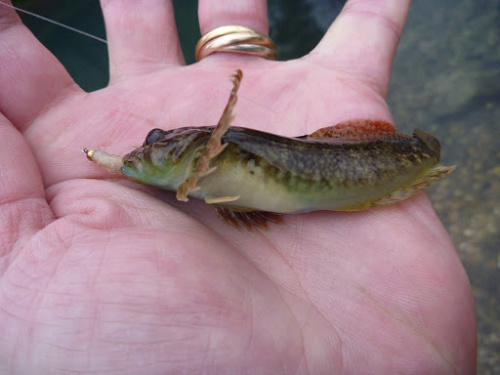 Sculpin fishing, as it is done in Japan, is about as simple as making the rod. You can attach the line to the lillian with a girth hitch, the same way you would attach a furled line to a tenkara rod or a keiryu line to a keiryu rod. The line itself is just tippet, and the same 5X that you probably use for tenkara fishing would be fine. The most interesting aspect to the line is that it is only 3 or 4 inches long! Clamp on a split shot in the middle of the line. Choose a hook based on the bait you choose. In Japan, the preferred bait seems to be salmon eggs. I am pretty sure that a small piece of worm would work as well, in which case a Gamakatsu Smallest hook should work fine. I suspect the same basic fishing method might work for darters also, where precise placement of the split shot and bait are critical. For darters, a hook with a smaller point would be better, perhaps the Owner Smallest or Gamakatsu Ultimate. The following Youtube videos show sculpin fishing both with and without an underwater scope, which works about like a diving facemask. I have only caught sculpins once, and I have to admit it was not with my sculpin rod. I was at one of Missouri's Trout Parks, which are actually pretty similar to some of the managed, stocked, pay-to-fish "Areas" in Japan. I think most Areas are lakes, but there are stocked pay-to-fish streams as well. I was with Alan Luecke and Jeff Dannaldson. We all caught some trout, but as soon as Alan saw a sculpin, he and I started fishing for them rather than the trout. If we could see a sculpin on the bottom, all we had to do is put a small bead head white Killer Bugger right in front of it and almost without fail the sculpin would take the fly. A white Killer Bugger was preferred because it was easier to see and thus to maneuver into the right spot. A second strategy was very much like the Japanese method shown in the video, but rather than sticking the rod tip and fly down between rocks, I dropped the Killer Bugger right beside a rock that had enough space for a sculpin to hide under it. Not all rocks had sculpins under them, but enough did to make that a viable strategy when no sculpins were visible in the open. A sculpin would come out to take the Bugger but only if it was within just a few inches of it's hideout. So why catch 4" sculpins instead of 14" trout? I catch trout all the time. 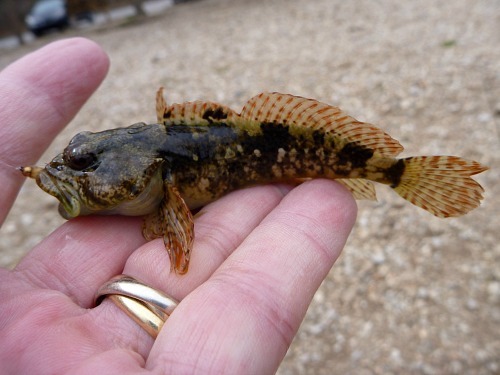 Sculpins, though, I'd never caught sculpins before. Besides, there is a special attraction to micro fishing. If you haven't tried it, do. If you've done it, you understand.